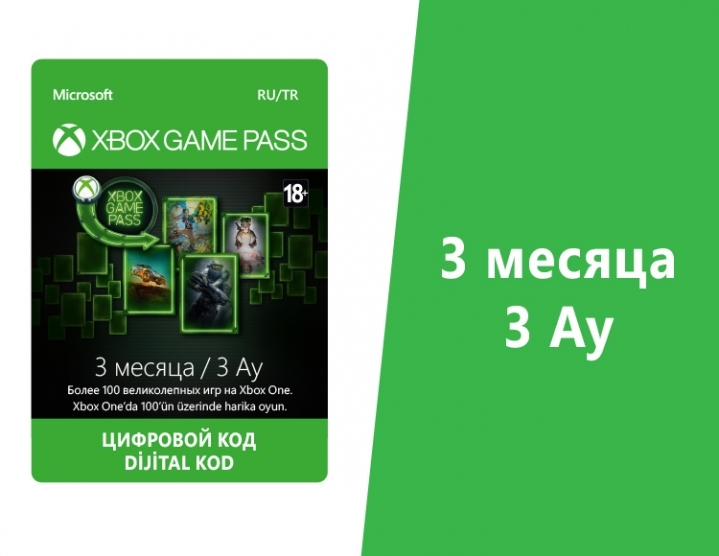 You buy a payment card both for the renewal and the new activation of the Xbox Game Pass subscription for 3 months. Codes may have a limited duration! You must use them within 10 minutes after purchase! Clever men like e_commerce, and other dealers bypass the goods side! Xbox offers all new and more profitable ways to access the coolest games. For a small monthly fee, the Xbox Game Pass gives you unlimited access to over 100 great games, including popular backward-compatible Xbox 360 games and blockbusters for Xbox One. The Xbox Game Pass subscription catalog is updated with new games every month (sometimes games are withdrawn from the catalog), so that there will always be interesting new items in it! Download the games of the leading publishers and fully play them offline for up to 30 days! Subscription Xbox Game Pass allows you to play really endlessly. How to activate a purchased Xbox Game Pass? - In the upper right corner, find the "Login" button, click on it. - If you already have an Xbox Live account - go under your data. If there is no account, register it. - After logging in, move the cursor to your account (upper right corner, where there used to be "Login"). - In the pop-up menu you are interested in "Redeem Code"
- Enter the characters from the purchased card and enjoy the golden status of Xbox Live.